Note: These tanks have not DOT certified. But they are Refillable. Here’s a complete oxy-acetylene welding kit to handle a broad range of cutting, welding, and heating applications. 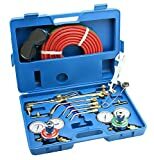 Comes with hoses, welding and cutting torches, goggles, tip cleaners and striker packed in a heavy duty molded storage case. Precision welding, cutting, brazing, soldering, hand facing and more! This is not a Victor Brand. The gas welding outfit includes cutting attachment, torch handle, heating head, pressure regulators of type 30-15-510 acetylene regulator, 30-100-540 oxygen regulator, welding nozzles and cutting tips. All HP cylinders come with a 10 year hydrotest date stamped. All HP cylinders are within 2 years of stamped date. Meets DOT and/or ISO regulations. DOT number is stamped on the tank. Rated Safety on Valve: 3,360 psi. 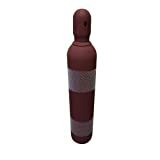 Manfacturer’s Cylinder Specifications: 80 cu/ft Steel High Pressure Gas Cylinders: Working Pressure = 3AA2015, Test Pressure = 3360, Diameter = 7-1/4″, Length = 32-1/2″, Weight = 35 lbs. It is advised to contact your local gas supplier(s) to verify their policy on re-filling customer-owned cylinders. No Return on Full or Empty cylinders due to DOT regulations associated with the transport of the cylinders. In cases where damage occurs during transit, Weldfabulous will do our best to correct the issue. Please contact us for any questions or concerns. Shipping only available to Continental US (Lower 48 States). All Acetylene cylinders come with a 5 year hydrotest date stamped. All Acetylene cylinders are within 6 months of stamped date. Meets DOT and/or ISO regulations. DOT number is stamped on the tank. Rated Safety on Valve: 3,360 psi. Manfacturer’s Cylinder Specifications: 75 cu/ft Asbestos-Free Acetylene Cylinders: Working Pressure = 8, Diameter = 7″, Length = 26″, Weight = 44 lbs. It is advised to contact your local gas supplier(s) to verify their policy on re-filling customer-owned cylinders. 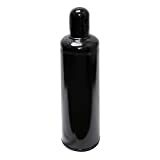 No Return on Full or Empty cylinders due to DOT regulations associated with the transport of the cylinders. In cases where damage occurs during transit, Weldfabulous will do our best to correct the issue. Please contact us for any questions or concerns. Shipping only available to Continental US (Lower 48 States). 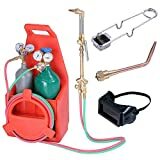 Ameriflame Medium Duty Brazing and Welding Outfit w/Plastic Carrying Stand is a professional contractor grade outfit for welding up to 1/8″ steel and brazing up to 1″ copper tubing with supplied tips. Capabilities can be expanded with a cutting attachment and other tips and accessories purchased separately. Outfit Includes: Size #0 Welding/Brazing Tip for brazing up to 1/2″ copper tubing and welding up to 5/64″ steel, Size #2 Welding/Brazing Tip for brazing up to 1″ copper tubing and welding up to 1/8″ steel, Welding Handle with front valves for finger tip control, Oxygen Regulator with protective rubber gauge boots and rear CGA540 inlet connection, Acetylene Regulator with protective rubber gauge boots and CGA200 rear inlet connection, 12.5 Ft. Twin Hose, Welding Goggles with flip up lenses and are designed to accommodate prescription eye-wear, Flint Lighter, Tank Key with Security Chain, Plastic Carrying Stand with storage compartment and brazing rod holder designed to carry a 10 cu. ft. (MC) acetylene tank and 20 cu. ft. (R) oxygen tank (Tanks Not Included – Sold Separately).